Local laws could be changing to make the process legal. 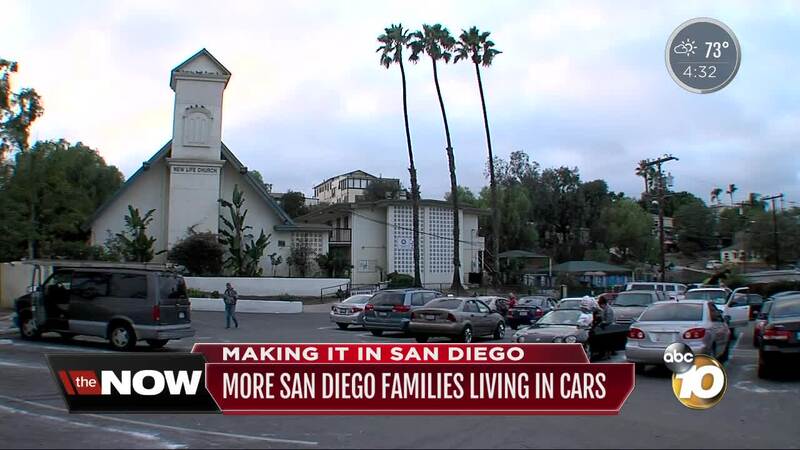 SAN DIEGO (KGTV) - San Diego’s housing crisis means there is a significant number of locals who are sleeping in their cars. Vehicle habitation has been illegal in the city for years, but local laws could be changing. 10News met 12-year-old Devin Glenn at a church parking lot this Tuesday night. “We're always here,” he says. Devin is a typical kid who likes to play on his phone after school, but every night he does it in a sleeping bag on the roof of his father's SUV. "Sometimes [it’s] really comfortable but sometimes it's really cold,” he adds. Glenn and his father are part of the growing number of San Diegans who stay overnight in a church lot instead of homes. “I rest my seat back and then just sleep right here. It's difficult because when I first started [sleeping in my car] my feet were swollen because I was sitting down,” says Sylvia Martinez. She’s been homeless and sleeping overnight in the church lot for the past three months. “We get multiple requests from other regions of the County to expand. North County, in particular,” says Dr. Teresa Smith, CEO and founder of Dreams for Change . The nonprofit provides safe overnight lots, like the church lot, for families who are sleeping in their cars. They’d otherwise be threatened with tickets from city police. In the past year, Smith says calls for help have almost doubled and a higher percentage clients are children. “On any given night we have about 50 kids running around,” Smith adds. About two weeks ago, there was a partial win in the courts for those fighting to relax laws about vehicle habitation. A federal judge issued a temporary order that San Diego police have to stop citing people who are living in their cars. It comes after a group of homeless people sued the city over the language of the law. It is, however, still illegal to sleep overnight in oversized vehicles like RVs, unless you have a permit. In a city with little affordable housing, car-dwelling can be a means to survive. “We couldn't really afford a place to live when we moved here. We had a lot of money but our money just went away,” says Devin. Now he sleeps under the stars and dreams about what his future home might look like. “Pretty much the whole house is wooden. There’s about 4 rooms and a backyard,” he describes. Dreams for Change has a number of case workers trying to get clients permanent jobs and permanent housing. The federal court still needs to make a final ruling about the vehicle habitation laws.